Sri Aurobindo was born in India 15th August 1872. From an early age he was educated in England at St Paul’s school and then Kings College Cambridge. Abrilliant scholar the young Aurobindo had the opportunity to take a prestigious position in the Civil Service. However during his university years he became increasingly committed to the ideal of Indian Independence so turned down the opportunity. ON returning to India he became increasingly influential in the Indian independence struggle. In 1909 Aurobindo was arrested on a charge of sedition for his alleged role in the Alipor Bomb plot. It was whilst in jail that Aurobindo underwent profound spiritual realisations became aware of Vasudeva “God” in everything. Receiving spiritual instruction from Sri Krishna and Swami Vivekananda he followed his inner Command or “Adesh” to withdraw from politics. Thus after being dramatically acquitted by his good friend and lawyer C.R.Das Aurobindo moved to the French province of Pondicherry where over time he built up a spiritual community or Ashram. Although never outwardly looking for disciples. He began to attract sincere seekers and soon the fledgling ashram grew. A significant moment in the growth of the Ashram and life of Sri Aurobindo was the arrival of Madame Alfonso who became known as “The Mother” and was an integral part of Sri Aurobindo’s mission and spiritual identity. After breaking his leg in an accident Sri Aurobindo retired from active life living in relative seclusion to undertake his arduous spiritual disciplines. Although withdrawn from the world Sri Aurobindo was a prolific writer. He wrote philosophy, literature, poetry and many letters to his disciples. After attaining his full spiritual realisations and being successful in his attempts to bring down a new spiritual consciousness Sri Aurobindo left the body on December 5th 1950. His mahasamadhi took place just 3 years after India had achieved her independence a goal he had long striven for. 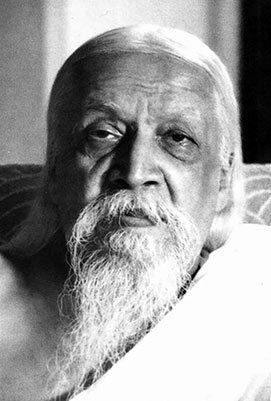 Sri Aurobindo was a Seer Poet who through the medium of poetry offered a glimpse of the highest spiritual realisations.